Pinch hitter Tyler Moore blooped a two-out, two-run single to right field in the eighth inning to help lead the Washington Nationals to a 3-2 win in their postseason debut, beating the Cardinals 3-2 Sunday afternoon at Busch Stadium. 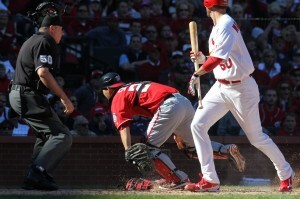 The Cardinals had a chance to add to a 2-1 lead when they loaded the bases with no outs in the bottom of the seventh. Allen Craig, the NL batting leader with runners in scoring position grounded to short for a force out at the plate. Yadier Molina grounded the first pitch he saw into a 6-4-3 double play ending the rally as Nats’ pitcher Ryan Mattheus used just two pitches to escape the jam. The Cardinals took advantage of a wild Gio Gonzalez, who walked seven over five innings to take a 2-1 lead in the second inning. Adam Wainwright was in line for the win after he struck out 10 in 5.1 innings. Mitchell Boggs took the loss. Jordan Zimmermann opposes Jaime Garcia in game two on Monday afternoon.